Bags by Riedle has created a messenger that equally addresses the blind, the visually impaired and people who can see: TopLuxe Braille. In addition to its embellishment the paper bag is also embossed with a braille message. As a result of the enhancing haptic components the model also contributes to the inclusion of people with disabilities. 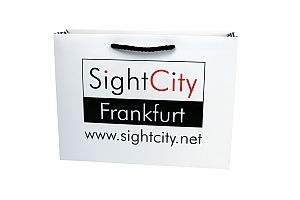 The first TopLuxe Braille was produced for the trade show SightCity Frankfurt, the trade fair for aids for the blind and visually impaired. The name of the fair was printed in colour in normal writing, a striking braille embossment was also integrated into the design. The jury of the Promotional Gift Award 2018 distinguished the remarkable integration tool in the category Custom-made Designs. The robust, reusable bag is produced in the EU from FSC-certified paper following a climate-neutral process. It is completely recyclable and can be customised with an all-over offset imprint, hot foil embossing and UV varnish. Over 170 cord colours are available to ensure a CI-compatible design; individual layouts and formats round off the options.